The iTel Alpha is a new phone from iTel to feature a new naming series. The device is a budget phone with a modern design offering average specifications and features. 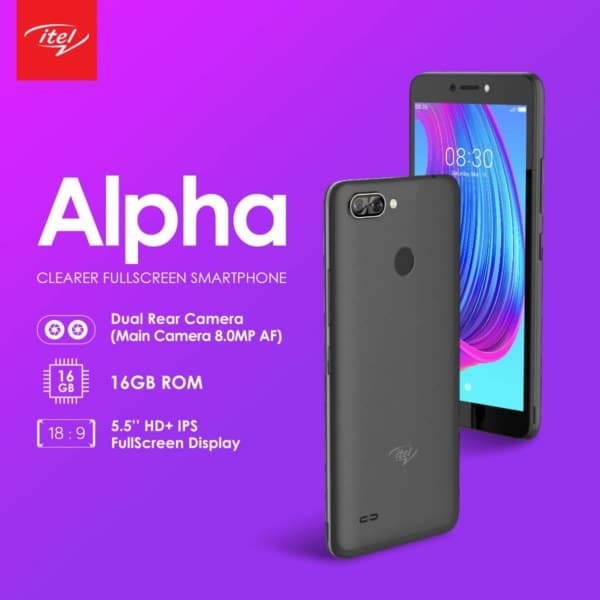 Below is everything you need to know about the new iTel Alpha which will include the specifications and the price. In terms of design, the iTel Alpha did not come in a unique body. It still maintains average body design on most iTel products. It’s built with a premium plastic measuring 152.7 x 72 x 8.5 mm in dimensions and weighs 163 gram. The smooth panel has a horizontally arranged camera at the top, while the fingerprint sensor is sitting below. On the front, you will notice the presence of notch both on the top and bottom of the screen. The top bezel house the front camera, an LED flash, and the speaker. The bottom bezel is where the three navigation buttons are placed. The phone is shipped in multiple colors. The iTel Alpha has a screen display size of 5.5 inches with a resolution of 480 x 960 pixels and 189 PPI density. It’s equipped with IPS LCD capacitive touchscreen with display protection that is scratch resistant and it reaches up to 73.2% screen-to-body ratio. On the camera aspect, the iTel Alpha has a dual 8 + 0.8-megapixel main camera that features Geo-tagging, touch focus, PDAF, HDR and single LED flash. The sensors working together is capable of shooting 720p video resolution at 30 seconds per frame. For selfies, the phone offer’s a single front camera of 5-megapixel that features Face Unlock, Face Beauty, HDR, and an LED flash as well. The iTel Alpha is powered by MediaTek MT6580 chipset with a Quad-core processor that clocked at a speed of 1.3 GHz paired with Mali-400MP2 for graphics. It runs on Android 8.1 (Oreo, Go Edition) operating system with a nonremovable battery capacity of 2400 mAh which does not have support for fast charging technology. The internal memory is 16GB which is expandable via micro SD card up to 32GB and it’s also paired with 1GB of RAM for smooth performance. Other features on the device include Wi-Fi 802.11 b/g/n, Wi-Fi Direct, hotspot and Micro USB 2.0 with 3G network support. The iTel Alpha is now available and the phone is selling at a price of $69.